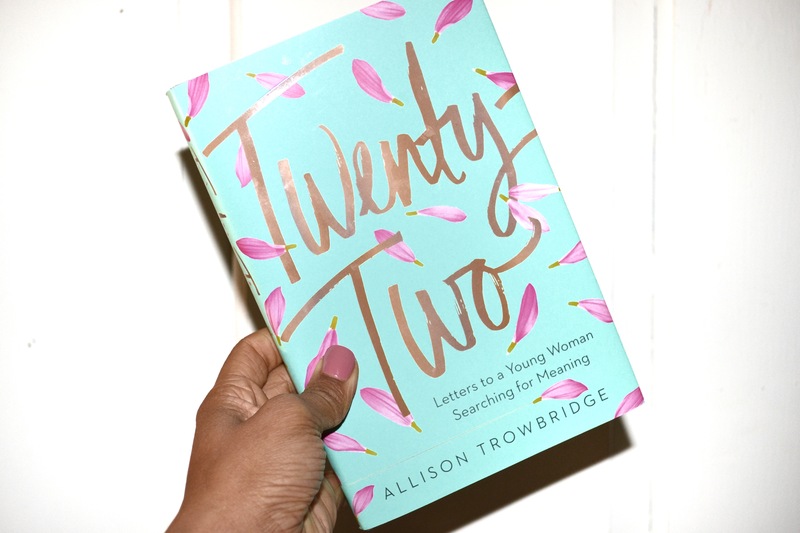 About a month ago, the kind people at Elle communications sent me the book: Twenty-Two: Letters to a Young Woman Searching for Meaning, by Allison Trowbridge. As a 22 year old, I was excited to read this but was honestly a little concerned that it would be cliche, and just another “Chicken Soup for a College Grad.” Thankfully, it ended up being the complete opposite. I love learning about the lives of the authors and various content creators I engage with. It gives me insight into their words and allows for me to connect with who they are, and their work, in a deeper way. Allison, is a entrepreneur and now published author (#girlboss) who works in advocacy against human trafficking and modern day slavery. She graduated from Westmont College in Santa Barbara, CA and is currently working on her MBA at the University of Oxford. Check out her website here! Like many books, this one included quotes of praises from notable people. As someone who had never heard of Allison Trowbridge, it was cool to see some of my favorite organizations and authors like Christian author Bob Goff, Caitlin Crosby Benward founder of the Giving Keys, and Sarah Dubbeldam editor-in-chief of Darling Magazine, affirm the greatness of this book. Twenty-Two is an genuine collection of stories about friendship, decision making, transitions, beauty, self-worth, and Jesus. Every other page I found myself reaching for a pen to underline all the nuggets of truth. Throughout the book, Allison uses her own experiences to share advice and talk about how she navigated the world of growing up and becoming a “real adult.” This is the perfect gift for the college graduate in your life, it’s practical, its a fun read, and the cover is gorgeous! I already have two friends on the list to read it, let me know if you want to be next! Great review! I’ll have to pick up a copy for myself, too. I think it’s so important for women of all ages and generations to support each other, and sharing their stories is a powerful way to do that. Thanks for bringing this book to my attention. You’re right ~ a great graduation gift! I’ve been looking for a new book to read and this sounds like something I would like. Do you know if it’s sold at bookstores or do I have to order it online? I am pretty sure it is also sold at major bookstores, like Barnes & Noble! Another one of my friends were just talking about The Defining Decade! Definetly going to be a summer read for me! I have not heard of this book! I love reading about new books. Reply	The Unemployed College Graduate's Guide to "Adulting".